Owner Ivan Pugh is a former caterer with Louisiana roots, which means what you get here is the real thing. This tiny restaurant has come a long way since its beginnings as a Kentucky Fried Chicken. And the folks in East Dallas—and those who drive a little farther to get owner Ivan Pugh’s Creole and Cajun specialties—are better for it. 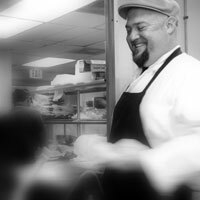 Pugh is a former caterer with Louisiana roots, which means what you get here is the real thing: shrimp and crawfish étouffée, alligator and chicken jambalaya, and muffalettas stuffed with ham, salami, mortadella, provolone, and that salty-good olive salad. Even something as simple as blackened chicken is spot-on—and a favorite paired with collard greens cooked to the appropriate wilting point with no trace of bitterness. But this is Texas, after all, which means that crawfish enchiladas are on the menu, too: snug little corn tortillas filled with grilled vegetables, crawfish, and Jack cheese, smothered in a dee-vine spicy cream sauce, and served with red beans and dirty rice, of course. Cajun fettuccini is another not-so-traditional dish, with tender grilled chicken and andouille sausage rolling around in a red pepper cream sauce, and dang if it isn’t as good as those enchiladas. The bottom line is everything here is made from scratch—even the root beer. And it certainly doesn’t hurt that the people behind the counter banter with customers like old friends, and you’ll see Pugh himself behind the line, manning the saucepans or garnishing the plates. I’ve saved the best for last, but you should eat them first—and hurry, because they sell out fast. They’re the boudin balls: pork sausage, rice, and vegetables rolled with breadcrumbs, and lightly fried. At $4.95 for six, these little appetizers are addictive and cheap—a lethal combination. Get contact information for Alligator Cafe.